Later this week, the 47th National Farm Machinery Show and Championship Tractor Pull will begin at the Kentucky Exposition Center in Louisville, Kentucky. The four day event always draws large crowds from across the country, with last year’s attendance reaching just over 300,000 people. More than 1.2 million square feet of exhibit space will be used at the show to display and demonstrate the latest technological advancements and products from more than 850 exhibitors. Just as we were at the 2011 show, we’ll be at this year’s show providing updates to those of you who can’t make it. What began in 1963 as an electricity demonstration and exhibit, quickly gained momentum and was renamed the National Farm Machinery Show in 1969. Also started in 1969 is the annual Championship Tractor Pull, where drivers battle it out for a share of $200,000, as well as the fame and glory of winning. 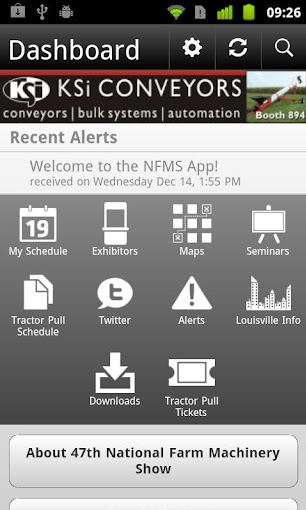 New for 2012 is the addition of a free National Farm Machinery Show mobile application, named “NFMS ’12”. Available for iOS, Android, and Blackberry devices, the app provides users with an interactive map, schedules of seminars and speakers, Louisville area information, and frequent show updates. In addition, the app will give exhibitors a way to provide product updates, text alerts, and instant connectivity as the show is happening. Social media is also being used to connect attendees to this year’s show, with the National Farm Machinery Show’s Twitter account and Facebook Page already in full swing. 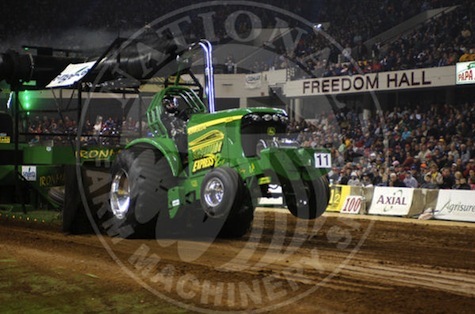 The National Farm Machinery Show kicks off on February 15 and will last through February 18th. The Championship Tractor Pull will be held every night, with an additional show held on the afternoon of Saturday, February 18th. While the National Farm Machinery Show is free to attend, the Championship Tractor Pull seats are reserved with ticket prices ranging from $35-$45. Are you planning on going to the show? Let us know in the comments or on the MachineFinder Facebook Page!